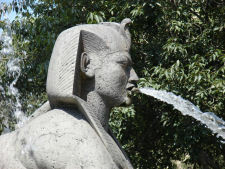 The French have long displayed a strong interest in Egyptian culture, and Paris has been a showplace for its architecture and works of art since the 16th century. In this month’s Paris Insights we take a look at the numerous obelisks, pyramids, temples, and statues that one can find in the City of Light. August 2008 - Is French Gastronomy in Need of a Savior? April 2008 - Will Success Spoil Daniel Rose?